This report is republished from our SFForest.net site with minor edits. The San Francisco Forest Alliance (SFForest) is very concerned about the hundreds of trees slated for destruction in Glen Canyon, starting as early as this month. The appeal period for the first phase of tree removal ends October 14th. So SFForest called a neighborhood meeting at Glen Canyon Recreation Center on October 6th, and our volunteers distributed leaflets all through the area. We’d been concerned that many people who told us they wanted to come had prior plans owing to Fleet Week, Games, the Hardly Strictly Bluegrass Festival, and other activities. We need not have worried. All the seats were taken by the time the meeting started. By the end, a crowd of people stood at the back and sides of the room. We estimate that some 80-100 people attended. Six people spoke. The Question time, after the presentations, was vigorous; people clearly are interested in saving as many trees as possible, and they had questions not just for SFForest but also for Michael Rice (President of Glen Park Neighborhood Association) who was present. 1) Eric Miller, President of SFForest started by introducing SFForest as a grass-roots all-volunteer organization with no fiscal ties to the city government. He described our mission in trying to preserve public parks for the public, and encourage SFRPD to align their expenditures with the actual needs of park users. He emphasized that we support the removal of hazardous trees – but very few of the trees slated for removal are hazardous. He also emphasized that our presentation was based on documents we had obtained from the City. 2) Dave Emanuel presented the details of the plan for Glen Canyon, and the Rec Center Project in particular. He emphasized that we do not oppose the renovation of the Recreation Center. When the community process ended in December 2011, those who participated understood that 10-11 trees would be felled. Now, the number is between 58 and 70. Hundreds more are to be felled for various reasons, including trail-building and the Natural Areas Program. (Go to our dedicated website, Save the Trees of Glen Canyon for details.) What we want is transparency and accountability. SFForest should not have to use the Sunshine Act to get the arborist’s report or the bid documents. People are passionate about trees, and this information has to be made public. Arnita Bowman, who is one of SFForest’s researchers, also pointed out that US Fish & Wildlife is proposing to designate the grassland side of Glen Canyon Park as an endangered Franciscan Manzanita critical habitat, which would further restrict usage and could lead to more tree-felling. The public comment period for the proposal closes on November 5th and information on how to comment is HERE. 3) Alma Hecht, a certified arborist, spoke to the importance of tall trees as a windbreak, for its acoustic values, for wildlife including the large birds like owls and hawks. She pointed out that senescence is not a reason to remove trees, unless they are hazardous. The charm of Glen Canyon is its forests, in the sense of natural beauty from the tall trees. The 160 replacement trees are relatively small species, and anyway it would be a lifetime before they would reach the maturity and beauty of the ones that exist now. 1) Several people wanted hazardous trees to be tackled and others left alone. 2) People felt the community process had been top-down, and their inputs – particularly about saving the line of majestic trees at the current entrance from Elk St – had been ignored. 3) One person supported the felling of 10% of the Canyon’s trees to make way for Native grasslands (and was promptly opposed by someone else who didn’t want to lose “even one tree” for that purpose). 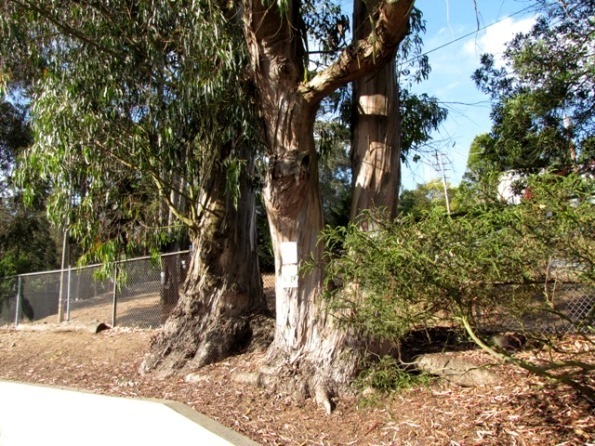 4) Michael Rice, the President of the Glen Park Neighborhood Association (GPNA) was present, and a number of questions were directed to him as to their position and why they hadn’t acted to save the trees. The people with questions were members of GPNA. 5) There were a number of questions as to why District 8 Superintendent Scott Wiener was not listening to the concerns set out at this meeting. Someone hazarded a guess that he assumed that GPNA support represented the majority view. With nearly 2700 signatures on the two petitions to stop the deforestation of Glen Canyon, it’s clear there is not anything close to community agreement on the changes that will affect the canyon. Add your voice, if you haven’t already and SIGN HERE. This entry was posted in Felling Trees and tagged Glen Park Neighborhood Association, SFForest Public Meeting, Trees. Bookmark the permalink. I think it would be helpful if other GPA members would consider writing Michael and explaining to him that he is entitled to his personal opinion. But he should not try to make his personal opinion the position of the GPA. His address is mrice100@sbcglobal.net. Also, if you know, other members of the board, you might want to contact them as well. 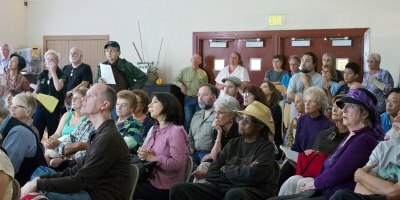 At Saturday’s meeting in the Rec Center, I think it was apparent that the majority of attendees were in support of the Forest Alliance and their positions regarding Glen Park Canyon. Had you hung around after the meeting, you’d have heard a number of GP Neighborhood members who agreed that our association should get behind the Alliance and their efforts. Anyway I’m writing, to suggest we invite the Alliance to address the next Association meeting, and then adopt an official position. It’s becoming quite evident that while Glen Park Association controls the newspaper its members are no herd. It’s time for new thinking from the next generation in Glen Canyon!